Greyhound racing is first and foremost a business, and trainers and track owners place financial gain over the welfare of animals. Florida is home to more tracks (twelve) than anywhere else in the country. When greyhounds do not run profitably, due to injury or age, they are of little use to the racing industry. Thousands of greyhounds are killed each year in the United States. The “fortunate” ones are killed humanely. Losing dogs may be shot, abandoned, or even sold for medical experimentation. To ensure a constant supply of new racers, more than 25,000 dogs are bred each year in the United States. Some unwanted greyhounds are rescued by adoption organizations, but there are simply not enough homes for them all. At least 5,000 former racing greyhounds are killed each year. Even for winning dogs, the realities of kennel life are shameful. Racing greyhounds spend most of their lives— 18 to 20 hours a day— confined in cramped crates with little human contact. 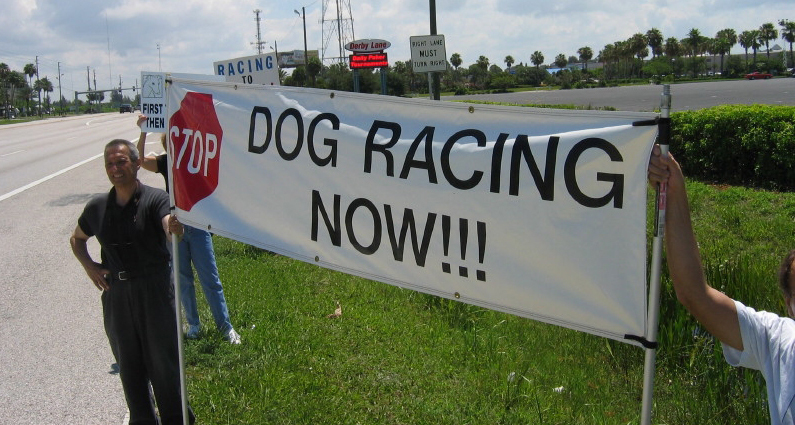 The abuse and neglect of racing greyhounds is common at kennels and tracks in Florida. There have been numerous media reports of dogs subjected to cruel treatment, suffering injuries while racing, and of ex-racing dogs being abandoned. Visit GREY2K USA to learn more about greyhound racing in Florida. As long as Florida greyhound tracks abuse and exploit greyhounds, ARFF activists will stand up and be a voice for these gentle dogs. Avoid greyhound tracks. Tell your friends, family, and coworkers about the tragedy of greyhound racing and urge them not to attend or bet on dog races. Consider adopting a needy greyhound!